After a cloudy start, the day has ended sunny and warmer than expected with the high reaching 57 degrees. 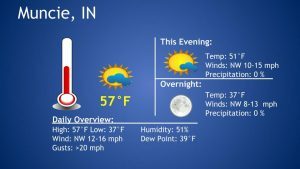 The temperature will drop into the evening, and reach an overnight low in the upper 30’s. Winds will be brisk from the NW at 8-13 mph, and gusts upwards of 20 mph. A slightly rainy evening is expected tomorrow so enjoy the sunshine tonight! Tomorrow’s temperatures are expected to be similar, but with less sunshine to offset the cold.